US pre-medical student Emily Temple-Wood writes a new biography of a woman scientist every time she is sexually harassed online. 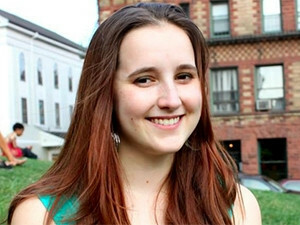 Although but one of the millions using social media to fight marginalisation, US pre-medical student Emily Temple-Wood recently rocketed to global renown for her unique method of productively responding to online harassment while tangibly combating the underrepresentation of women and their achievements. For every time she is sexually harassed online, Temple-Wood adds a new biography of a woman scientist to Wikipedia. The final-year Biology student at Loyola University, who will begin medical school at Midwestern University later this year, says she has been upholding this commitment for a few months now. "I'd kind of thought of the idea before - when I'd get super frustrated with misogyny either [in real life] or on the Internet, I would go home and write an article [for Wikipedia] to do something productive with my with my anger, and one day I got a couple of [harassing] e-mails and decided to commit one article for every troll," she explained in an interview with ITWeb. Beyond being a proactive method of spiting sexists, Temple-Wood's commitment contributes needed labour to the extensive task of addressing underrepresentation of women's achievements - not only in scientific fields - on the world's most popular online encyclopaedia and seventh-most visited Web site. At the time of writing, just 16.12% of all gendered biographies on English-language Wikipedia - the free, collaborative encyclopaedia's largest branch - are about women. While this statistic can be viewed as a projection of historical underrecognition of women (Temple-Wood notes, for example, that it is more difficult to compile a Wikipedia article about somebody who is less written-about), many have pointed to the encyclopaedia's male-dominated curation community as a contributing factor. While obtaining reliable statistics about the gender demographics of Wikipedia's editors can be tricky, numerous studies and surveys have suggested that under 25% of Wikipedia's editors are women, and that male Wikipedia users create and edit significantly more content on average than women users do. In a widely-cited 2011 blog post, Canadian journalist and former executive director of the Wikimedia Foundation Sue Gardner extensively expands on a variety of reasons women are generally discouraged from contributing to Wikipedia, one of which being "some women don't edit Wikipedia because they find its overall atmosphere misogynist". Yet gender is not the only metric for historical underrepresentation and continued marginalisation on Wikipedia. Temple-Wood notes that she also makes a conscious effort to write about women of colour. "There's a double bind with women of colour because they've been systematically underrepresented more than white women, so it's harder to find [information about] them and there are fewer of them," due to socio-economic marginalisation, Temple-Wood explains. "That being said, there are [still] plenty to write about." Although she made her "one troll, one article" commitment just a few months ago, Temple-Wood has been on a mission to improve the representation of women scientists on Wikipedia for over three years. In November 2012, she co-founded WikiProject Women scientists: A WikiProject being a team of Wikipedia contributors working together to improve the site in a specific way; WikiProject Women Scientists being "dedicated to ensuring quality and coverage of biographies of women scientists". The project was born after Temple-Wood, herself an aspiring scientist, noticed that a substantial number of women fellows of the esteemed Royal Society did not feature in Wikipedia articles. "I got [angry] and wrote an article that night," Temple-Wood is quoted in a 2013 Wikimedia blog post. ""I literally sat in the hallway in the dorm until 2am writing [my] first women in science article." Among the numerous other WikiProjects devoted to improving representation of women is WikiProject Women in Red, "whose objective is to turn redlinks [indicating a deleted or nonexistant article]" about "women - real and fictional - their biographies and their works... into blue ones [signalling an existent article]". Other WikiProjects focusing on women in specific fields of expertise include WikiProject Women in Technology, WikiProject Women's sport, WikiProject Women writers, and WikiProject Women artists. Temple-Wood's impact on the gender gap in scientist representation has been "epic", according to former Wikimedia Foundation staff member Siko Bouterse. At the time of writing, WikiProject Women scientists has 81 contributing members and has yielded thousands of articles, seven of which have been selected by Wikipedia editors as "featured articles": "considered to be the best articles Wikipedia has to offer." WikiProject Women Scientists has also produced 28 biographies deemed "good articles," and 398 selected for Wikipedia's front-page "did you know?" section. Temple-Wood alone has produced around 300 new articles. "I did this really cool thing called #100wikidays where I wrote 100 articles before the end of the year last year, so that was 100 of them," she says. "I try to do one a day, but some days I do more and some days I can't do any because life gets in the way," she explains. "I also try to do a little bit of improvement on an existing bio every day, making sure it's formatted correctly, adding facts, copy editing so it reads better, finding a picture, stuff like that." According to her Wikipedia user statistics, Temple-Wood has made over 56 000 edits - averaging 17.4 per day - in her time editing Wikipedia. While short biographies compiled from scarce information can be completed in half an hour, "if it's a long biography where there's lots of information about the subject, it can take months of work," she reports, noting that she can only spend an hour or two each day working on Wikipedia. While many in 21-year-old Temple-Wood's generation "wouldn't even be able to find information about things that haven't been put on Wikipedia," as one commenter quipped on a Facebook post appreciating her work, Temple-Wood has built up a collection of favourite sources for Wikipedia articles. Most are biographical dictionaries, both online and offline, she says, as well as "random things I come across, like obituaries and awards." Some of her favourite sources include the Biographical Dictionary of Women in Science, and the US National Library of Medicine's Web site, she offers. Born in 1994, Temple-Wood has been editing Wikipedia since she was 12, and became an administrator when she was 13. "I did a lot of stub-sorting and a lot of anti-vandalism work," she says of her early Wikipedia days in a Wikimedia Foundation video profile. "I was able to be really productive on the administrative side of things because it didn't require access to sources [or] knowledge of any deep subject: it just required knowledge of Wikipedia policy, which was something I could pick up at that age." Temple-Wood says her extensive work with Wikipedia has equipped her with writing and researching skills that prove useful to her academic work, and adds that her coursework in turn improves her work for Wikipedia. "All of my degree-related knowledge has helped me find new women to write about," and understand more about the importance and relevance of the discoveries and contributions they made to science, she explains. Temple-Wood's work can be seen as a form of what Vimbai Midzi, a Zimbabwean graduate of Rhodes University, calls "writing ourselves into history" in a TEDx talk she gave at the University of Edinburgh. "Forgetting is political. Often the histories that are forgotten are of people who don't have the social capital or the access to change the dominant narrative," says Midzi, discussing how online tools such as blogs and social network profiles can be used by marginalised groups of people to combat the underrepresentation and misrepresentation they face at the hands of mainstream media. "The act of remembering is an act of defiance against the erasure and the belittling that we face in different ways. The act of remembering is connecting the dots, filling the gaps, in all of the narratives that are rooted in racism and misogyny," explains Midzi. By means of example, Midzi recalls the #SomeoneTellCNN hashtag that trended globally on Twitter last year after CNN referred to Kenya as a "hotbed of terrorism", and Kenyans made global headlines addressing the news channel's distortion of facts. Midzi also notes the #RhodesMustFall and #FeesMustFall movements, which draw attention to the institutionalised racism and financial inaccessibility SA university students continue to face. "Now, these hashtags tell a story. They write African voices into history in all of their multiplicities and with all of their contradictions, because we're not all the same. We never were," says Midzi. Temple-Wood reflects that using her time and her voice online to reduce women scientists' underrepresentation helps her cope with the frustration that comes with frequent online harassment. "It's really easy to get sucked into rage - I still do sometimes, when [the misogyny is] really bad - and doing something positive, creating something, with that energy feels way better," she concludes.